"That's what he does. He puts together big at-bats and gets big hits," Dodgers manager Dave Roberts said of Granderson. "We've seen that from the other side from him. Back-to-back days, a couple of big homers for us, and obviously for us, the grand slam was huge." "The key is to just relax, not do too much, understand the pressure is on the pitcher," Granderson said of his approach with the bases loaded. "Get your pitch and not chase out of the zone. Cole is one of the top pitchers in the game and he was rolling early, but he made a few mistakes and we capitalized." 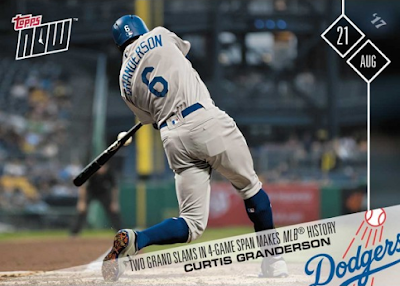 "Hung a bad slider to Granderson," said Cole, who allowed the first grand slam of his career. "We had success with him in the previous at-bat. In hindsight, probably should have challenged him. I'm trying to create a ground ball there with the slider. You know, whatever." Curtis Granderson hit a grand slam in his final at-bat with the Mets last week, and gave the Dodgers their eighth grand slam of the year with his seventh inning blast. That mark ties the 1952 Brooklyn Dodgers club for third-most in a season on the all-time franchise list. 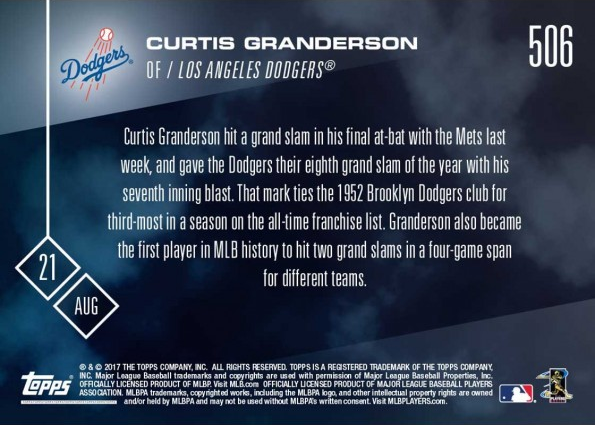 Granderson also became the first player in MLB history to hit two grand slams in a four-game span for different teams.